Magazine submissions are invited for the next issue of the Ethical Rebel. We are always interested in hearing what you think about ethical fashion and issues in the fashion industry. Below you will find our theme and the topics we are covering in our next issue and guidelines on what we are looking for. Do lots of research and keep your writing concise. We are looking for content that is informed and informative, intelligent yet easy to read. If you would like to submit a feature article, you can write about anything related to one of our ethical fashion topics: pollution and plastics; textile waste; and Modern Day Slavery. (See more about these below). Choose a topic and angle that you are passionate about. For example, you may choose Modern Day Slavery as a topic, to explore why there’s slavery in the fashion industry or explore how people can make sure there is no Modern Day Slavery in the garments they buy. Make sure you research any facts you include thoroughly and include the source of any statistics. Fashion has been labelled as the 2nd biggest polluter in the world, polluting waterways with pesticides, dyes, treatment chemicals and plastic microfibres. As a result, clean drinking water has become a scarce commodity in places like China and it is thought that we are all regularly consuming plastics shed by our clothes. Pesticides used to grown cotton are linked to high cancer rates in cotton farmers. Tannery workers, including children, stand barefoot in carcinogenic chemicals and various acids that can cause chronic skin conditions. An estimated 90% of these tannery workers will die before the age of 50. What can the fashion industry do to clean up its mess? Who is inspiring you with how they are tackling these issues? A huge amount of clothing gets thrown away. Much of it is unused or simply in need of minor repairs. Luxury brands destroy millions of pounds worth of surplus stock. Have we lost all appreciation of how much work goes into the making of our clothes? Charity shops are becoming ever more popular, providing quality clothing at an affordable price. In any High Street, the charity shops have far more customers than many of the High Street fashion retailers, but they still have far more clothes donated to them than they can sell within the UK. Does rescuing unwanted textiles and transforming them into new garments and accessories add value to our clothes again? We have become so attuned to buying cheap clothes that we have forgotten just how much work is involved in making them. 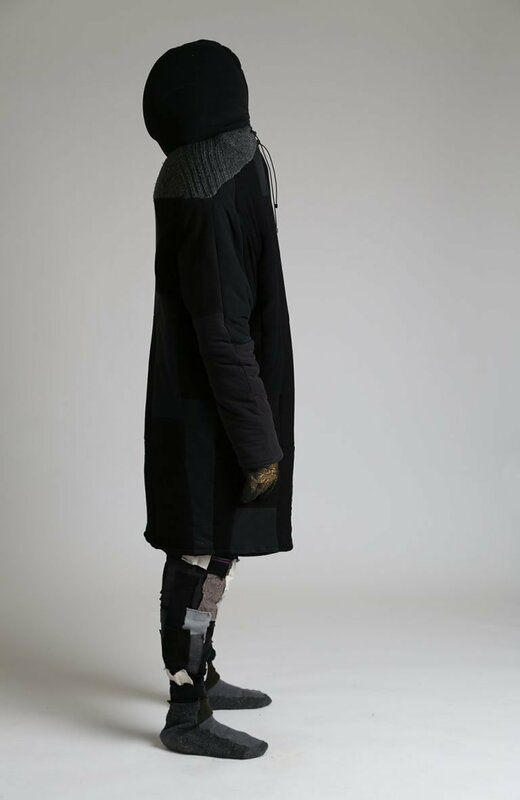 Clothes have to be made by hand. There is currently no machinery capable of putting fabrics together to create clothes without the skill of a garment worker. Very few of these skilled garment workers are paid a living wage. In order to keep costs low factories buy fabrics from or subcontract manufacturing to businesses using slave or child labour. Few supply chains are slave free. In many countries, even in the UK, garment workers seeking fairer pay and conditions are beaten. 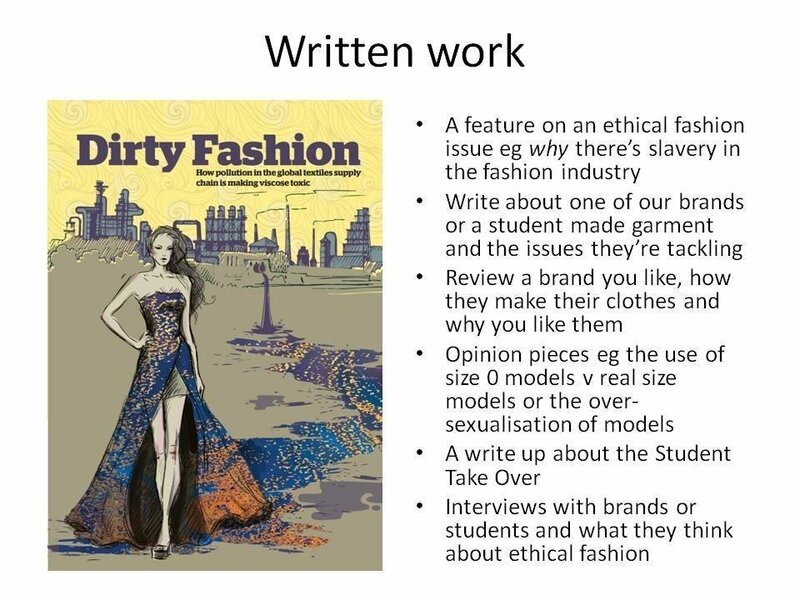 Write about an ethical fashion issue that bothers you. Have your voice heard. Write about the Student Take Over, the processes and research done by the students, what they’ve learnt and how it has affected them. Please send your work in a Word document, double spacing, Arial size 12 with your suggested title. If we need to edit your work, we will still credit you as the author but will include the wording Edited from an article submitted by….. Written submissions can be of any length but must be your own original and previously unpublished work and not submitted elsewhere. If accepted, your work may be featured on the Ethical Rebel website, in the magazine or both. Full Disclosure: By allowing the Ethical Rebel to publish your work, you grant us permission to use your work in any of our publications, websites, marketing material, advertisements, videos and any other mediums or formats used in the creation, dissemination, and monetization of Ethical Rebel content. Please send your work to ethicalrebel@outlook.com with the name of the author and links to your website for linking purposes to help promote your work. Please ensure that the link and the author’s name you send us are spelt correctly. To be considered for publication in the magazine ALL work must be submitted by 28th February 2019. Optional: If you want feedback on any proposed submissions, please send them to me by 15th February 2019 so that you have time to edit it for the final deadline. It is proposed to launch the magazine in May 2019.